Like most DIY homeowners at the beach or really anywhere, USA, who want a coastal decor, I will fill every possible nook with ocean finds. You give me a corner and I’ll make a vignette of a painted sea green table, shells, a coral fan and ocean watercolor. (I actually paint watercolors). So what about the cement patio, the wooden floor under your feet, the lonely wall in the kid’s room? For the small 8 X 15 cement and wrought iron enclosed patio in the front Shotgun house I want a large compass in aqua blue and yellow/gold. The blue will match the shutters I plan to attach to this 100 year old home and the yellow is to match the color of the house. I have white trim, so I can use that color as the base if I paint the entire cement pad, three stairs and short path to the fence. If you’re not an artist, no problem, stencils and huge stickers are available at every hobby place or online. Not so tough, right? 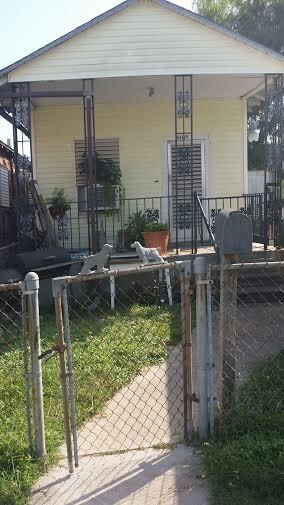 I want to point out the original gate, dogs on the top and mailbox that will very quickly get a facelift with paint and landscaping. 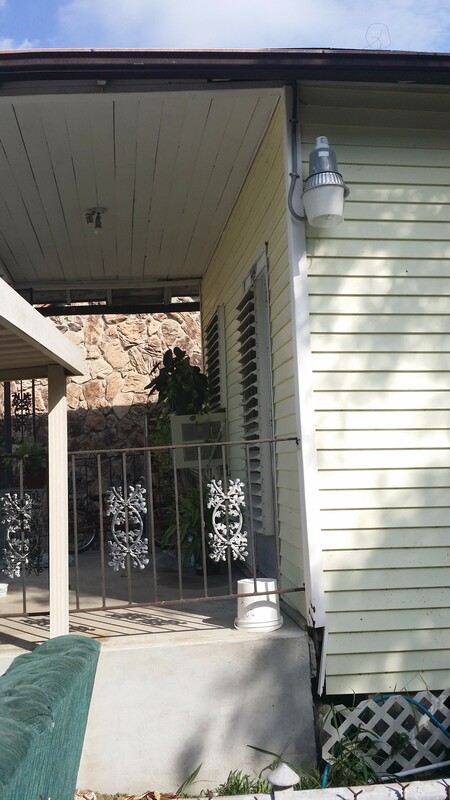 I’ve already planted fuchsia bougainvillea to climb the iron trellis and a gardenia bush near the mailbox. Photos to come soon. Okay, now let’s talk about the shiplap walls that this home is completely exposed now. (Thanks to my accidentally picking at the drywall when I moved in and finding this gold mine). I fancy an octopus for the painted white wood in my bathroom. A really big blue one! 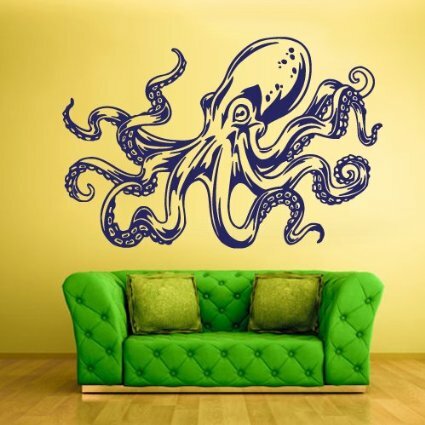 I found this Huge sticker at Amazon for $28.00 and it is less expensive for me to buy the sticker than to paint an art wall. The best part is a waterproof sticker is perfect for a salty sea bathroom. HINT: When you choose your project, just remember to seal your artwork with polyurethane, a spray sealant or wax if you’re applying to furniture or wood. Follow Me On BLOGLOVIN’ Where You’ll Find MORE Blogs With Any Interest You Have!